Since 2017, the TOPACE Award is hosted by the UNESCO Chair for Education about Sustainable Lifestyles, Prof. Victoria Thoresen. 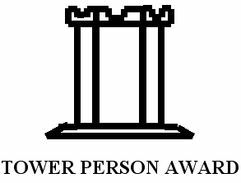 The annual Tower Person Award for Consumer Educators has been donated by the former president of the German Association of Consumer Organisations AgV Prof. Dr. Dr.h.c. Heiko Steffens / Technische Universität Berlin in the Millenium Year 2000. The award consists of a token (the blue tower) and a document with the name and merits of the winner. The prize is awarded to persons, not to institutions. Institutions should receive Honourable Mention, if the awarded person works for or has been considerably supported by institutions. The Honourable Mention consists of a document summarizing the merits of the institution. The donator has established a committee (jury), members of which are at present Victoria W. Thoresen (Assoc. Professor of the University College Hamar/Norway; director of Network PERL), Nieves Alvarez Martin (author, former director of Escuela Europea de Consumidores in Santander/Spain) and the donator himself. 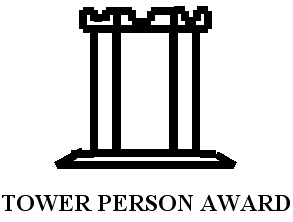 The idea of the Tower Person Award for Consumer Educators was born in view of the tower of the Palacio de la Magdalena in Santander/Spain, where consumer educators from all parts of Europe assembled at a conference in October 1999. Villages, monastries and castles have often been built around towers. In the history of consumer education since the middle of the 20th century consumer education has been kept alive and promoted by persons, who invested a lot of energy, time and effort into convincing institutions and relevant people of the importance of consumer education, publishing material, organizing conferences and many other valuable activities. As strategic centers of action these persons have attracted recognition and motivated others to join the network of consumer educators in Europe and around the globe. The tower symbolizes the outstanding achievement of dedicated consumer educators and may encourage successors.